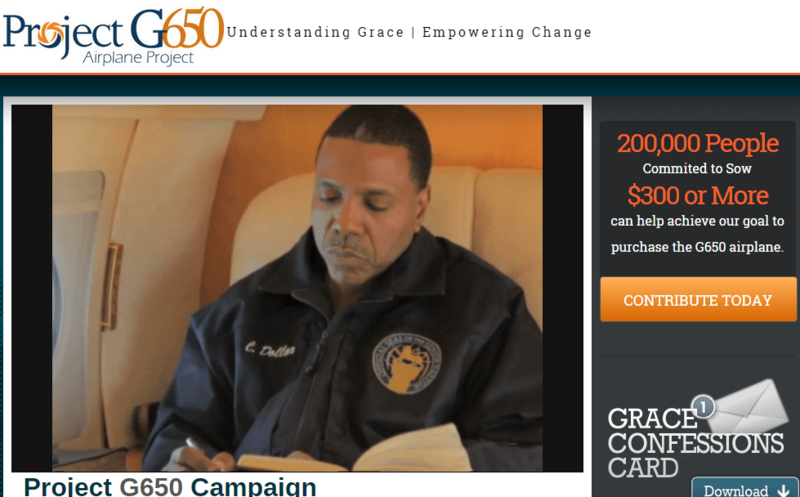 Way back in 2005, Creflo Dollar’s ‘blab-it-grab-it’ mentor, Kenneth Copeland, convinced quite a few donors to contribute to his ministry’s purchase of the world’s then-fastest private jet, the Cessna Citation 750 a/k/a the “Citation X” for only a cool $20 million—which Copeland uses regularly to travel to his Steamboat Springs resort home. It worked for Copeland, “Only for you, Lord Jesus” (check out Copeland’s prayer dedication of the jet here)… so what the heaven, why not? Dollar narrowly escaped a Senate subpoena along with five other jet-flying, luxury-car driving, mansion-dwelling, televangelists when our economy tanked in 2008 and again in 2011 when Senator Grassley issued his final report on religious non-profit fraud. The Senate report about Dollar, based on information provided by the Trinity Foundation, details his numerous properties, mansions, jets, etc. Check out what African American News Site “The Root” reporter Kirsten West Savali has to say about Dollar’s new “project”. awesome post, i hate these crooks getting rich off of preaching christ. good job.